Where do you like to indulge in your craft? Is your favourite arm chair your little knitting cubby area, or do you prefer to ‘knit in public’? 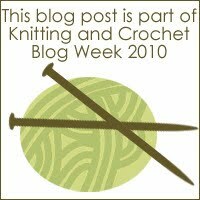 Do you like to crochet in the great outdoors, perhaps, or knit in the bath, or at the pub? Excuse me while I extricate myself from my chair and come to the computer. 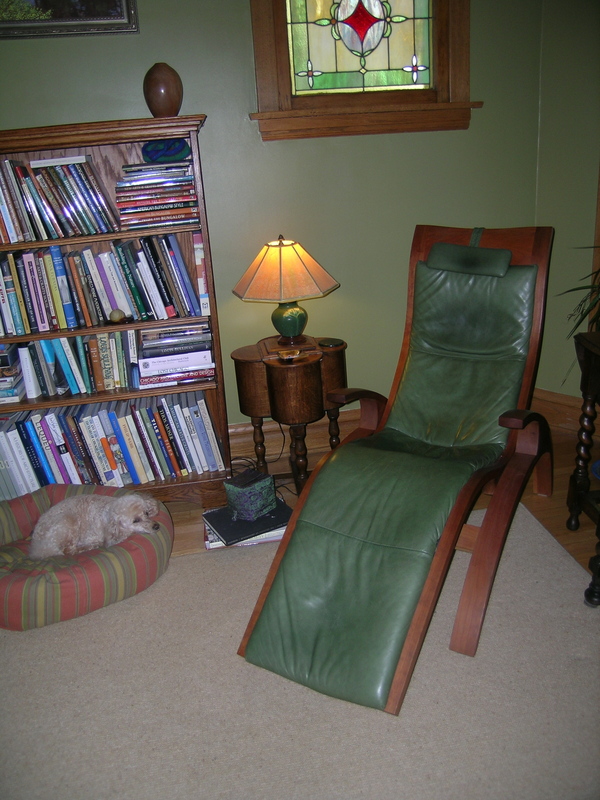 Hands down, my Thomas Moser Chaise Lounge Chair. If you have never sat in this chair, try it out whenever you can. It is a zero gravity chair, so you lean back, your legs are up, and all the pressure is taken off your spine. And it is hand made with beautiful American Cherry, and a leather uphostered seat. Everyone who sits in it agrees it is heaven. That is Lloyd in his bed next to the chair. 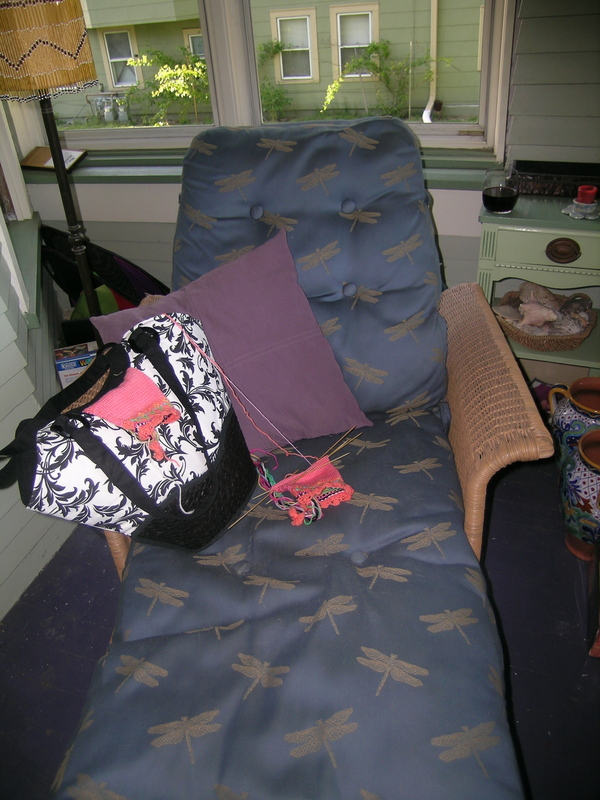 And, if the weather is nice, I sit on the enclosed front porch in my chaise lounge enjoying the morning sunshine. Working on the sleeves for the Zebra sweater, then I have to tackle the neckline. 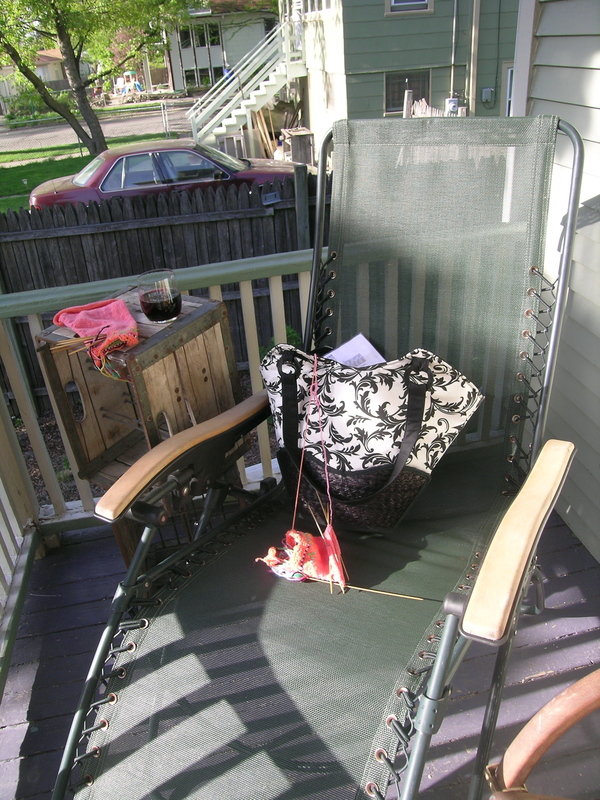 And, if it is nice in the afternoon, I sit on the back porch, or in the yard in my portable chaise recliner. With a glass of wine naturally. See any patterns? Like a cat, I follow the warmth and comfort wherever it will lead me. hmm, your Thomas Moser Chair looks amazing! Ooh, I like that chair. I love those chaise recliner dealies. Your stained glass is quite lovely. Wowee, I have always loved those zero-gravity chairs, and yours actually looks great! Nice little corner ya have there, with the doggie and the pretty window. That looks like three heavenly places to knit. I love the different feel of each one.